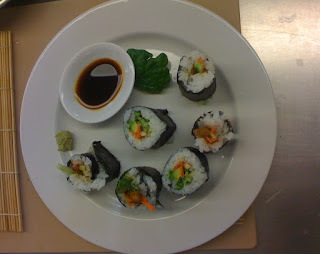 This is our economic unit of vegetarian maki sushi, 25 cents per piece, before overhead. Not bad for our first time on the mat. It is an interesting time to apply reality in economics to the classroom. We thought we would coordinate with the economics class and figure out how much each individual piece of something we make might cost (to keep things simple we added food and labor costs together, ignoring overhead and things like service taxes). We warmed up on sushi in our first class and then for the combined class, used potstickers as an economic unit of study. Needless to say our combined class was fun, even tasty, but it was not what I would call a controlled environment. Notice no pictures of potstickers (and note to self: do not combine 2 classes of hungry teenagers right before lunch and cook great smelling food that can be eaten with the fingers). I often get questions on food served in school; since we teach our Culinary Arts class in the cafeteria, it is a natural question and a tough one to respond to. We all want better. It is difficult to display acceptance for something we are all quietly (or less quietly) ashamed of. 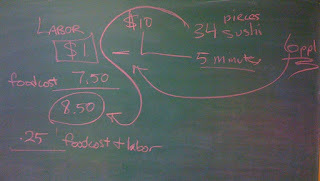 And we know its economic unit, how much it costs ($2.74 per student, give or take a few cents). Now it looks like I’m becoming an economic unit, measured to be cut. And so is my boss. And my principal. And our Spanish teacher. And our wellness counselor. With this first round of cuts, 482 teachers and 163 administrators for SFUSD received provisional notices that our services are not required. I feel a little bit like that end piece of sushi that might need to be trimmed off and thrown away. None of us have been fired yet, but the problem is big enough where the only thing that is known is that this is the safest measure to take. Most of us notice-receivers probably think that our individual situations don’t justify this action– my reasoning is because my principal, myself and my CTE boss created this class and got this position written. We see this class actively engage students every day in hands on learning. The results have been positive enough that we were also recently told that my position will remain written in. And now with these layoffs, it is possible someone else could take this position over because I am the new kid on the block. In a way it sounds safe and fair. Just like pre-portioned meals in nice, neat, plastic sealed packets. I’m not writing this with bitterness, we are facing a big, nasty-no-matter-how-you-slice-it-problem. Culinary Arts the way we teach it here is an elective class I’m passionate about ( I am not doing it for the money, believe me), but if there really is no money, I can’t expect to take precedence over core classes and services that are also being cut – or to keep my job over someone else who has been here longer and is qualified. At this point, I still hope better learning doesn’t get sacrificed with the cutting, portioning, slicing and dicing – it is hard to see how it won’t. Our world is not an economic unit. We know this after our financial crisis came to the forefront. We’ve tried to make it so, with our justifications for requiring more efficiency and more numbers to make more profit and our willingness to turn around and let those numbers guide us and our ethics. We see how it has created problems on every level, from bank bankruptcies to school food. Our world is human. We need to teach our children how to be humans. How to not be swayed off their work by the hundreds of text messages (think 300-600) our average student gets daily. We need to focus on how to connect with our students in this commerce driven, passive and distracting world we have created for them and help them actively understand that you can think for yourself and that you can think enough of yourself to take pride in everything you do. And to our adults, we need to connect with them to help them understand how having our state reduce its educational funding to the lowest amount of money spent per child in the country is something we really can be ashamed of – more than the $2.74 meals served to our students everyday. NOPA Helps Us In So Many Ways – And Save The Date! You can now DONATE ONLINE through our YMCA Capital Campain here! Copyright © 2019 Heat of the Kitchen. All rights reserved.